An unfinished story has a way of driving the sanest to the brink of insanity. Raven has a score to settle. In her younger years, Heath and his friends were continually bullying her and her twin. Left with unanswered questions of what exactly happened Raven seeks revenge. Fate opened a door and she becomes the nanny for Heath’s young son, Kade. She helps him start a horror story with the plan to bring the horrible creature Kade created into the real world to torment Heath and his friends. It was perfect until the plan unraveled. When Kade’s creation no longer wishes to do Raven’s bidding, it becomes a fight for life or death. The only way to survive is to figure out how to finish off the creature before she finds her freedom. Will Kade find a way to stop the creation of his malevolent mind before Raven’s revenge consume them all? Cat gives this one 5 Cat claws! I don't usually read horror, but on occasion, I like a good scary story. I am so glad I got this one. I will admit I didn't read it right before I went to sleep and one night I still dreamed of things chasing me! SO back to the book. 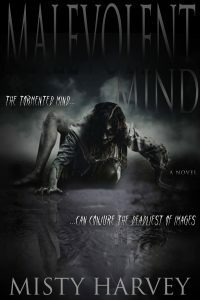 Malevolent Mind is about a deranged woman that is seeking revenge for her twins death when they were children.She has an elaborate plan using Heath Luxxy's own son to get her justice. She poses as a nanny and encourages Kade to write a story for his dad. Se uses voodoo on the story to bring the character to life. Oh man! Did little Kade have an imagination. Zilla is one scary character.I loved how well Misty described Zilla. I could visualize her as if he was in front of me. She also used other senses very well like the sense of smell. I could smell the fishy yucky water! And sounds. I loved the skittering! I found all of the characters well-developed. Heath, I could feel his grief from the loss of his wife and the desire to do right by his son. Raven I liked her. She was sweet even if a bit deranged. She was still likable. I already told you about the evil creature how great it is; then there is little Kade. He is such a doll, and my heart went out to him when the creature came to life scaring them. The story is fast paced, and I wanted to keep turning the page. Once the action begins the twists start coming, and I was very surprised a few times. I can say it was not predictable at all. The ending was magnificent even though it shocked me. If you like a good horror, with a scary creature, voodoo, cute kids and some twists you will like this one! Even if horror isn't your thing and you're looking for something different try this one out, There is no blood and guts stuff. It's not a slasher story. Just an excellent scary book! Just be sure to leave the lights on! Author Bio: Misty Harvey loves writing spine-tingling horror novels sure to thrill readers. The psychology behind such tales has always been a fascination for her since she was younger. Even to the point that she once contemplated taking up psychology as a profession. Still, her love resides in the art of storytelling. An art she wishes to continue to share with readers for the rest of her days. After climbing out of her writing cave and searching the house for the sound of the latest creak or pop, Misty can be found doing one of many things. Often times she spends the remainder of her day with her amazingly supportive husband and youngest daughter. While she has two older children that are out there spreading their wings around the world, including giving her a few grandchildren.